As I began to page through this book, I kept having to stop and verbalise out loud how much I wish we’d had a copy when I started to experience symptoms of postnatal depression. It’s written by three women: Andy Taub-Da Costa, Paula Levin and Zahava Aarons – two of whom have had postnatal depression and two of whom are mental health specialists. However, despite the authentic medical and psychological info in the book, its style and tone remain refreshingly ‘real’. They use ‘yummy mummies’, ‘I’ and ‘we’, ‘throwing in the towel’, etc. Un-scary language. 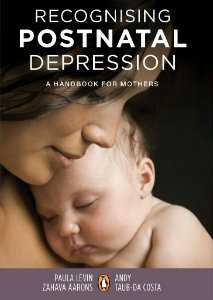 The book defines postnatal depression, with ways to tell if you have it and what to do if that’s the case. There are true stories from women who’ve beaten it, including Sam Cowen and Deborah Patta. There’s also a big chapter on psychotherapy (which, together with a brilliant psychiatrist and the right medication, was what saved me). And the book concludes with a chapter on treating postnatal depression ‘spiritually’. Unlike some of the mommies referred to in the Introduction, I’m not a propagandist of ‘blissful motherhood’. I do honestly, unapologetically and (lord help me) publicly admit the hell I went through. But I do this because, when I was in the dark, I thought I was the only one. So, in a sentence, thank G-d for this book. * This post originally appeared on zaparents.com.